Kim Kardashian West seems to be having second thoughts about her new summer 'do. The mother of three chopped off her lengthy locks, but already she seems to be regretting the decision. On Sunday night, she tweeted out a crying emoji along with the message: "Wait, I miss my long hair." 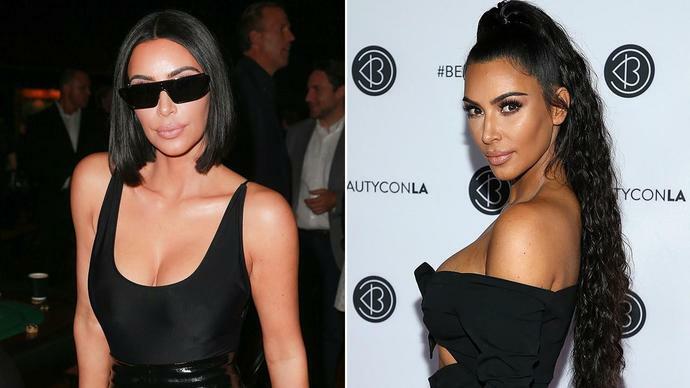 Kim's new bob hits right above her shoulders, and she recently rocked the new look at charity poker game benefitting City of Hope National Medical Center at The Forum in Inglewood, California, over the weekend. At the time, the 37-year-old reality star wore her new 'do straight with a part right down the middle. It wasn't her haircut, however, that her sisters were noticing at the event. On Kim's Instagram Stories on Sunday, she shared several videos of Khloe Kardashian and Kendall Jenner praising her recent weight loss. "I've never seen a human being look as good. It's like… you are a walking Facetune doll," Khloe gushed. "It takes work to look like that, it's awesome." In the clips, Kim revealed she's down to 119 pounds, basking in the glory of her sister's kind words. In addition to heaping the praise on Kanye West's wife, the famous family also spoke out defending Kylie Jenner and her new "self-made billionaire" status. "It's not like that was handed to her," Kim told ET's Lauren Zima at the charity event. "She figured that all out. I mean, we all have." Kim and Kylie's mother, Kris Jenner, added, "She made her own money for over a decade, she put it in the bank, she saved every nickel. And then, when she decided on what she wanted to do, she spent her money on a venture that could have gone south or north, and it did really well."